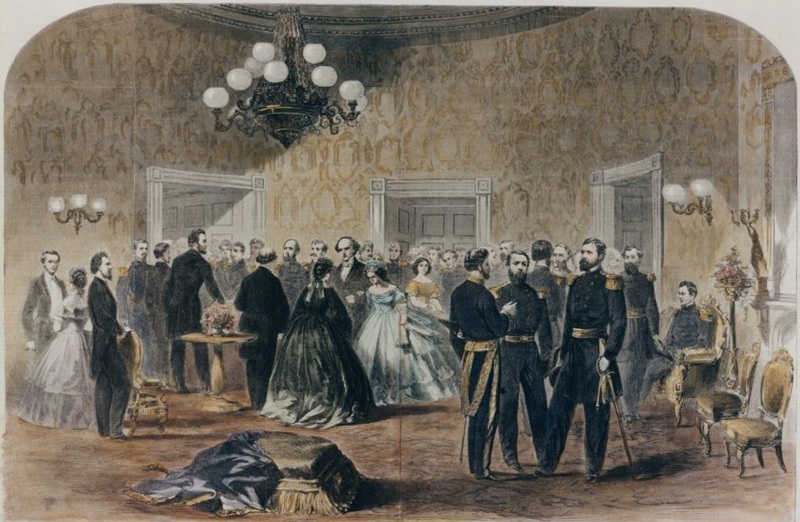 “Grand Reception at the White House, January 1863.” Hand-colored centerfold featuring a wood engraving by American artist Alfred R. Waud (1828–1891), Harper's Weekly, January 25, 1862. Image courtesy of the White House Historical Association. From 1863 to 1865 longtime Michigan resident Lois Bryan Adams lived in the District of Columbia and wrote a regular column for her hometown paper. “Her columns reflect contemporary opinions from the point of view of a woman, an ardently pro-Union Republican, and a middle-class northerner,” writes Evelyn Leasher in her introduction to a recent collection of Adams’s writings. “She was an observer or a participant in many of the events she wrote about and she provided firsthand information about a place few of her readers had visited.” Adams had married a newspaper editor in 1841; widowed in 1848, she never remarried, which allowed her the freedom to embark on several careers: schoolteacher, newspaper columnist, publisher and editor, poet (Sybelle and Other Poems appeared in 1862), government clerk (she was one of the first women in the civil service), and assistant to the director of a museum. Adams’s pieces in the Detroit Advertiser and Tribune during the Civil War never identified her by name; they were signed simply “L.” Her articles generally avoided news of the war and the nitty-gritty of federal politics. Instead, as is evident in the following columns (both published 150 years ago this month), they described daily life in wartime: a stroll through the dirty, crowded streets of Washington; a visit to the White House on one of the “public reception days” hosted by the President and his wife; and attendance at a public ceremony at which Lincoln was on the stage. Today’s readers will be struck by the extent to which government buildings—including the White House—had been accessible to citizens, who could simply “go up the steps and enter the open doors” in order to meet the President. The ceremony described in the second column took place in the “partially finished” Patent Office building, which had been under construction since 1836 and was not completed until 1868. (The building now houses the National Portrait Gallery and the Smithsonian American Art Museum.) Attending the ceremony were several dignitaries. Lucius E. Chittenden, register of the treasury, had the perhaps unenviable assignment of filling in for an absent Edward Everett, a popular and admired elder statesman who had served as Massachusetts governor, Secretary of State during the Fillmore administration, and U.S. Senator, among other offices. Also in attendance were Byron Sunderland, chaplain of the Senate, and Benjamin B. French, the commissioner of public buildings. 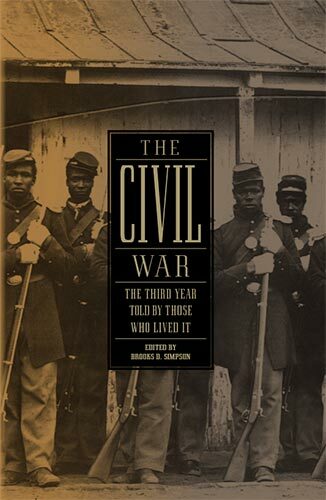 Originally published in the Detroit Advertiser and Tribune, both columns were reprinted in Letter from Washington, 1863–1865 (Wayne State University Press, 1999), a collection of Lois Bryan Adams’s writing edited by Evelyn Leasher, and included in The Civil War: The Third Year Told by Those Who Lived It, published last year by The Library of America. Note: During her stroll through Washington, Adams passes by Willards, which was a popular hotel. Saturdays are public reception days at the White House. From 11 till 3 o’clock all who choose can go and pay their respects to the President and his lady, pass through the room and conservatories and go on their way. . . . If you don't see the full selection below, click here (PDF) or click here (Google Docs) to read it—free! A very interesting account of the "day out" of Lois Bryan Adams. The description of the wet roads of Washington, the crowds headed for the White house and the mother and son pair anxious to meet Abraham Lincoln, makes such interesting reading that I could visualize the entire scene.The fact that people loved the warm persona of the kind President is evident from the account. Both the narrator and the mother-son duo realize their dream of meeting the President.